My Top 5 things to see and do in Chicago. I recently visited Chicago for the first time. It was somewhere I had wanted to go for awhile, without really knowing anything about the place. I just knew that people loved it, and so did I.
I was only there for a few days so had to carefully pick what I wanted to do and see, but I think I chose well. Here are my highlights and suggestions for your trip to Chicago. 1.Get a great view of the sun setting on a magnificent skyline. 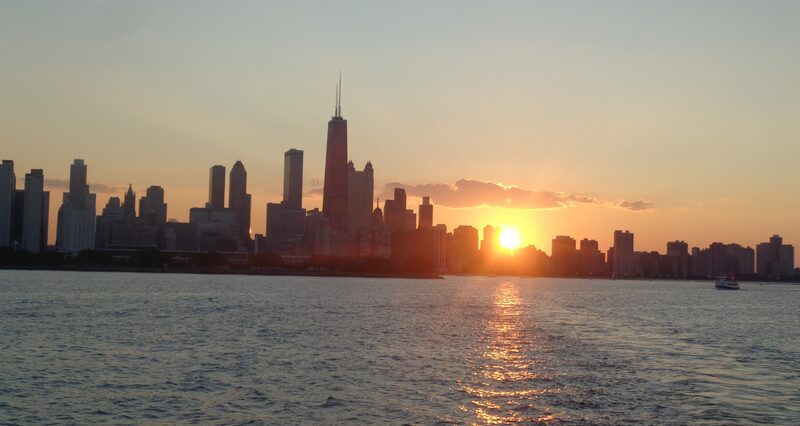 Chicago has a stunning skyline of beautiful buildings bordered by lake. Seeing it at sunset is even more stunning. Fortunately there are a few ways you can do this. Boat tours- you can get these along the river or the lake, if you choose your time carefully for sunset you get a spectacular view. I took the Lake Tour with Shoreline Sightseeing. The boat tour itself wasn’t anything special but the views I was able to see were. Navy Pier- this pier is pretty famous for the big wheel which also looks great at night, but it also gives you remarkable views over the city, you can read more about it later in the post. Museum Campus- this is the area where you’ll find some of the most famous museums in Chicago, including the Field museum and Adler Planetarium. But because it’s almost like an island, set out into the lake, you get a beautiful view looking back at the city. Make sure you check out the museums whilst you’re here too! The lakefront trail is a route that runs for miles and miles along the edge of Lake Michigan. Bikes are available to hire at various points along the route, making it easy to cycle. The route is also split into pedestrian and cycling sections, with no vehicles, ensuring no risks for the more nervous cyclists. I cycled this from just past Lincoln Park Zoo south down to Burnham Park, including some of the Riverwalk, and back again. I took lots of stops to see and take photos of the views and beaches and just loved cycling along in such a beautiful setting. It was genuinely a highlight of my time in Chicago. I’d strongly recommend it! By taking a few detours off this route you can also visit ‘Cloud Gate’ (also known as the ‘Bean’) and the Buckingham Fountain which was stunning in the sunlight. As well as the Zoo which was not only free, but also enabled me to see Polar Bears for the first time ever, which was incredible! I LOVE seeing as much of a city as possible, especially at night when it’s full of sparkling lights. So wherever I go I seek out a tall building to get a view from. I always get there just before sunset so I can see it in daylight and darkness, and if I’m lucky, get a nice sunset too. There are two options in Chicago. 360 Chicago and Skydeck Chicago. 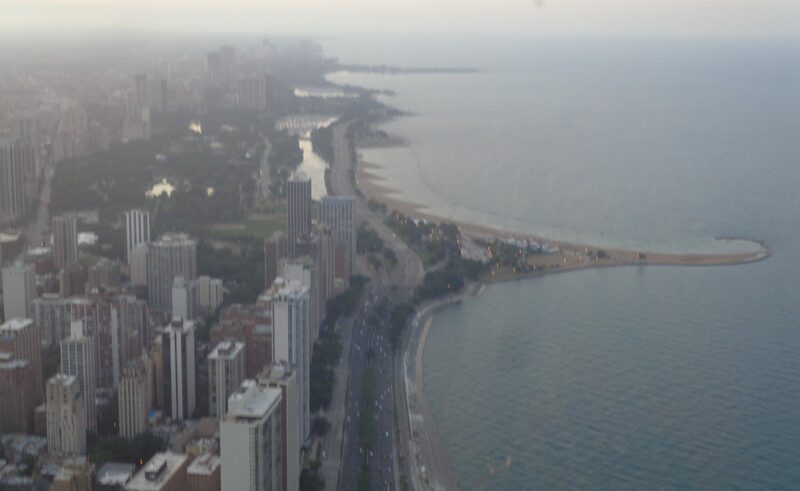 After extensive research I couldn’t see a major difference between the two and settled on 360 Chicago because it was nearer to where I was staying and gave a great view out across the lake. (There is also a Cheesecake Factory just outside which was an added bonus! )What’s great about 360 Chicago is not only the views, but that you can spend as much time up there as you like. There’s even a few tables up there (I sat there and ate my cheesecake) and some sofas and a bar, so you really can have a relaxing evening. Navy Pier is great because of the views of the city and lake, but it also holds a lot of other attractions too. There are lots of great little souvenir stores here and they were actually reasonably priced. There’s also lots of food places including the legendary Garret’s popcorn where you can try the weird flavours and mixes of popcorn. 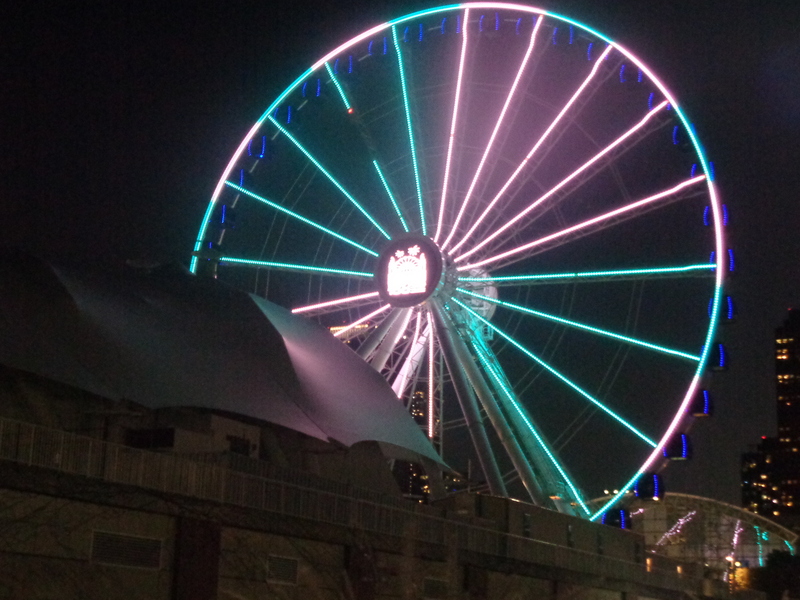 Not to mention the iconic centennial wheel and an array of other rides. I don’t do a lot of relaxing when on holiday- I want to make sure I’ve seen everything! But I made sure I had enough time to visit the gorgeous beaches and have a relaxing swim in Lake Michigan. If the weather’s good when you visit you should definitely head to the beach! There are so many in Chicago to choose from, all looking very inviting. I went to Ohio Street Beach because it was so surreal swimming with a beach and city view surrounding me, I’d never had that before and I loved it. Most of the beaches don’t have changing facilities or lockers, but a few do have toilets so think about which beach is best for your needs. Fortunately there are so many beaches that you can probably find one that you can walk to from your accommodation. I visited Chicago on my own and it is a great city for solo travel! There’s so much to do and people everywhere so you never feel alone or bored. It’s also a really easy city to walk or cycle around, making it easy to get to all of the top destinations. Have you been to Chicago? What were your favourite bits? Please leave them in the comments. Find more posts about travel on my Solo Travel page.